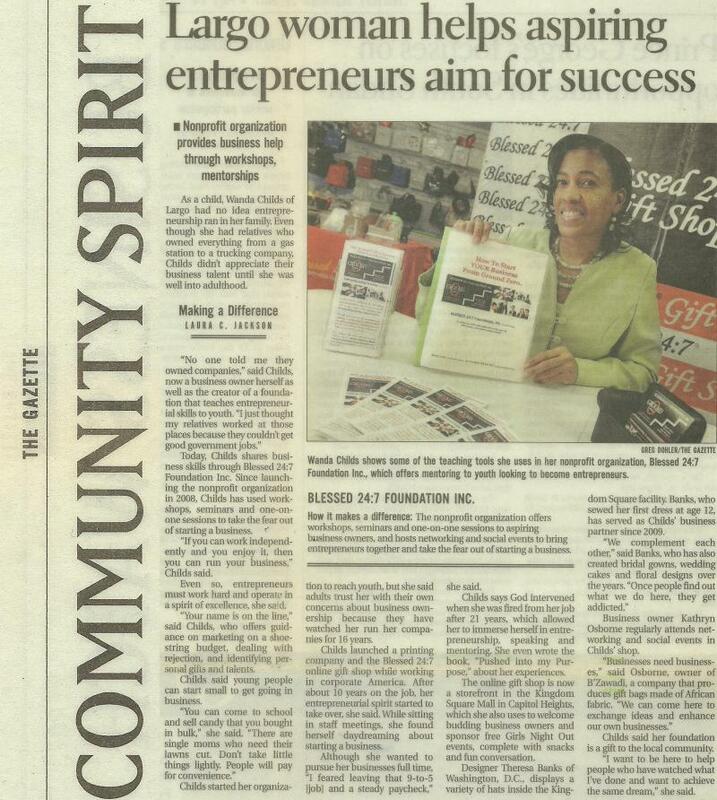 Wanda Childs established the BLESSED 24:7 Foundation, Inc., an IRS approved non-profit 501(c)3 organization, to assist our youth and adults with pursuing their dreams of becoming Entrepreneurs. 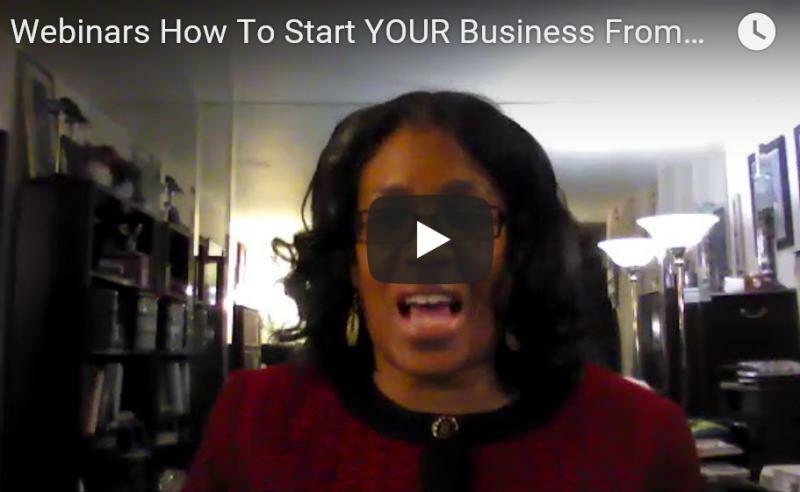 Through the efforts of the foundation, our seminars are designed to take the fear out of starting your business and an opportunity to Discover YOUR Purpose so YOU Can Live YOUR Dreams. ﻿Our seminars will assist and prepare individuals with the "Simple Steps to Starting Your Business From Ground Zero" and "Creating a Foundation for a Successful business". ﻿Realizing that a college education is a great opportunity for our youth and adults to pursue, the truth is, college is not always an affordable or available option for many. Many of our youth and adults have skills, services and talents that would afford them an opportunity to go into business for themselves. Our purpose is to mentor, motivate and prepare our youth and adults for the exciting world of Entrepreneurship! "How to Write Your First Book"! 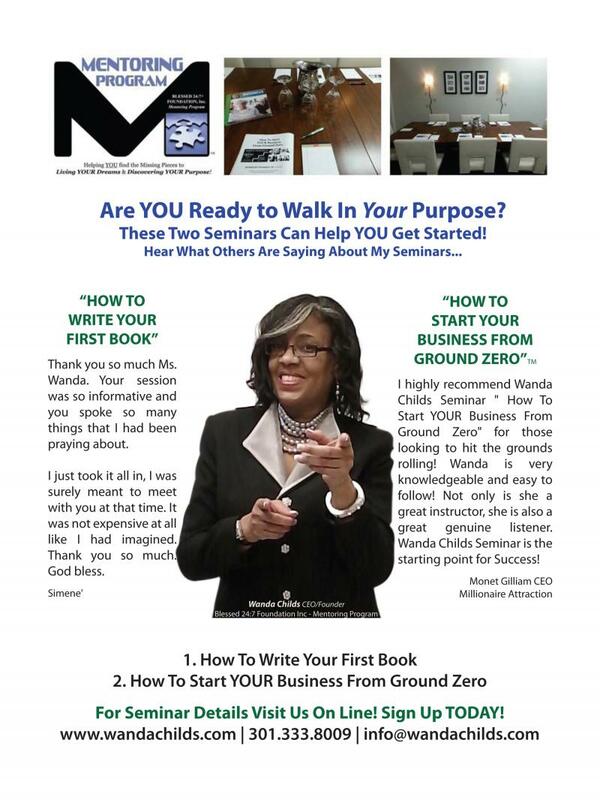 This seminar was designed to walk you through the basic steps to getting your book self-published. It has been said, there is a book inside of everyone, well it’s time to share your story with the world! Hear what others are saying about our seminars! ...Thank you Wanda Childs for a very informative and personal mentoring session! Not only did I gather insight into moving my business to the next level, but your selfless sharing and infectious passion for what you do was the boost I needed to see the vision God has given me seem less overwhelming and more doable! Much success to you in all you do!